This summer we will be turning the Coney Island beach into an outdoor movie theater in order to bring you some of your favorite movies. The best part: it’s all free and open to the public! Presented in partnership with the Alliance for Coney Island, NYC & Company, Good Humor Ice Cream and I Love NY, Flicks on the Beach kicks off on Monday June 30th, screening a beloved movie every week for eight consecutive weeks. The theater will be set up on the Coney Island beach between West 10th and West 12th Streets. Each week there will be live entertainment at 7:30pm, followed by a film screening at dusk. Some shows will include performances by the legendary Coney Island Circus Sideshow. • August 18th: Audience Choice! On August 18th, we will screen either The Sandlot, Grease or The Goonies, but we need your help! 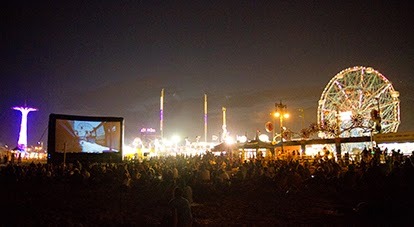 Vote online at Facebook.com/ConeyIslandFun and the audience favorite will be selected!